Indians shortstop Francisco Lindor is one of the best defenders in the game, yet he committed a critical error in tonight’s game against the Rangers. In the fifth inning, Lindor handled a routine grounder from Shin-Soo Choo and overthrew his first baseman, allowing two runs to score instead of ending the inning. 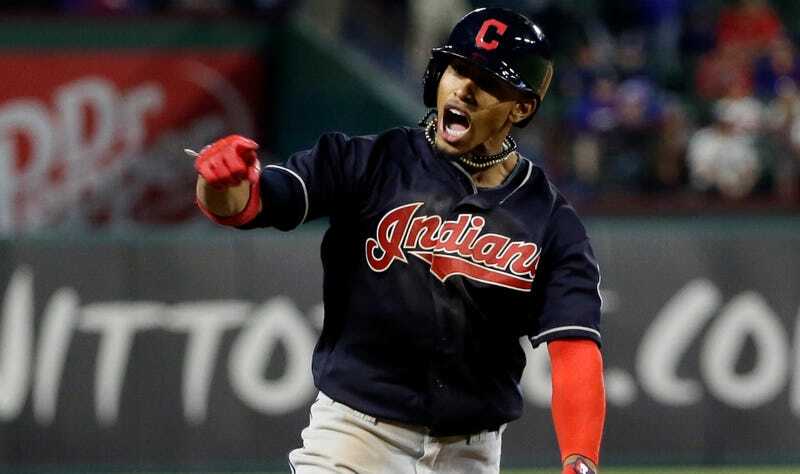 The Indians should have escaped the fifth inning up 3-2, but instead they left down 5-3 after Nomar Mazara singled in another run after Lindor’s error. And so Lindor promptly got to work, swatting a Cole Hamels pitch out to left field for a home run on his next at-bat to bring the Indians one run closer. After walking and stealing second in the eighth, Lindor stepped up to the plate with the bases loaded in the ninth. The Indians were down one run and any hit would have scored at least one runner. Instead, he smacked a huge dinger to right field to clear ‘em all and win the game for the Indians, 9-6. This Rangers fan was NOT pleased. Lindor came into tonight’s game 0-for-6 through the first three games, and the grand slam was the first of his career. His big night helped the Indians complete a neat three-game sweep of the Rangers, despite Texas’ many dingers.